Are you getting the urge to upgrade or remodel your Bucks County home? Is your kitchen not as modern or functional as it could be? Maybe it's one or more of the bathrooms in your home that are in need of a bathroom renovation. If you are seeking a contractor to handle your kitchen remodeling or bathroom renovation project, you won't find a more professional or experienced partner than our team at Lang's Kitchen & Bath. Founded in 1948, our family-owned company has a legacy of building our business by word of mouth from satisfied customers. Over the years, we have evolved a process that we follow in order to ensure the finished project meets with your approval. This includes discussing what you wish to accomplish with your home remodeling project as well as discussing your budget for the materials, fixtures, countertops, cabinets, appliances and any other components that will be needed to realize your goals. 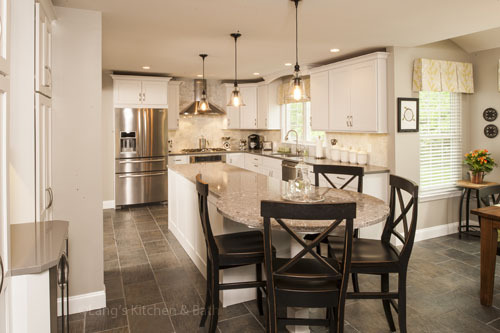 At Lang's Kitchen & Bath, we are experts at kitchen design and kitchen remodeling. We have the knowledge and experience to handle the entirety of a remodel job from laying out the designs and specifications through to putting all the components together that will yield your dream kitchen. If you need inspiration for a kitchen remodel, you can browse the pictures in our Kitchens Gallery on our website. Whether you're going for a modern, traditional, southwestern, farmhouse or any of dozens of other kitchen design options, we've got the experience to bring your dream kitchen from the planning stages through to reality. Do Your Bathrooms Need a Makeover? While we do excellent kitchen remodels, there's a reason that “bath” is also in our name at Lang's Kitchen & Bath. From redoing a small powder room to transforming your master bedroom's master bath into your oasis from the rest of the world, we can design and remodel beautiful and functional bathrooms for your home. As with our kitchens gallery, you can get ideas for a bathroom renovation from our bathrooms gallery on our website. We can go as posh or practical as you desire or can afford in terms of choice of flooring tile material, vanity, tub, shower fixtures and any other components. At Lang's Kitchen & Bath, we know that you, the customer, ultimately possess the vision for how to transform a room or multiple rooms in your home. We work with you to get a complete understanding of your kitchen design or bathroom design vision, and then we discuss your budget. We know that everyone does have to work within their budget, but we will do everything we can to get you maximum results for every dollar you spend without compromising the quality or the end result. Based in Newtown, we are convenient to any home in or near Bucks County. We pride ourselves on our work, and we are not satisfied with a bathroom design, kitchen remodeling or other project until you are. Please contact us today, so you can find out more about how we combine cutting-edge design, skilled remodeling and quality products to have you living in the home of your dreams.